Background & Objectives: There are many challenges in the execution of targeted therapy in cancer due to tumor heterogeneity between individuals. In case of solid tumors this is one of the reasons as to why genomic analysis from single tumor biopsy specimens underestimate the mutational burdens in such heterogeneous tumors thus contributing to treatment failure and drug resistance. Molecular characteristics redefine tumor classification for molecular targeted therapies ensuring the best patient specific therapies with better specificity and cost effective ratio. Functional imaging like Positron Emission Tomography & Computed Tomography (PET-CT) with 18-F Fluorodeoxyglucose (FDG) has been extensively used in oncology to assess the glucose metabolism in tumor cells since long. It has been further redefined to use other radiopharmaceutical targets capable of tumor characterization, microenvironment, angiogenesis, proliferation, apoptosis, receptor expression and few others. 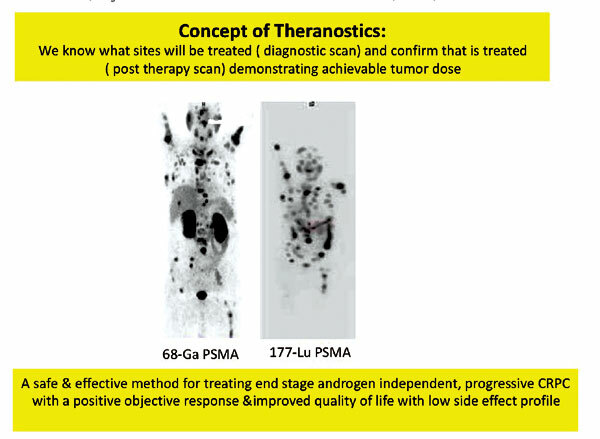 Among these the receptor expression in tumors have been studied in detail and specific imaging probes have been developed for imaging with either Single Photon Emission Computed Tomography (SPECT-CT) or PET-CT. Combination of these diagnostic tool with the same vector has permitted an easy switch from diagnosis to therapy using a therapeutic radionuclide when such expression is documented. Thus in Nuclear Medicine the concept of Theranostics have been utilized with ease and successfully implemented the theranostic concept and has become a valid example of personalized and precision medicine. Imaging and therapy of thyroid cancer, neuroendocrine tumors and castration resistant prostate cancer are current examples of this concept. Conclusion: Molecular imaging has high potential to link target identification with therapy and thus to personalize it. It also has a very high potential for in-vivo tissue characterization, to improve prediction, prognostication, road map for biopsy and monitoring of therapy. Keywords: Tumor heterogeneity, molecular characterization of tumor, functional imaging, SPECT-CT, PET-CT, FES, 68-Ga 177-Lu DOTA & PSMA. Keywords:Tumor heterogeneity, molecular characterization of tumor, functional imaging, SPECT-CT, PET-CT, FES, 68-Ga 177-Lu DOTA & PSMA. Abstract:Background & Objectives: There are many challenges in the execution of targeted therapy in cancer due to tumor heterogeneity between individuals. In case of solid tumors this is one of the reasons as to why genomic analysis from single tumor biopsy specimens underestimate the mutational burdens in such heterogeneous tumors thus contributing to treatment failure and drug resistance. Molecular characteristics redefine tumor classification for molecular targeted therapies ensuring the best patient specific therapies with better specificity and cost effective ratio. Functional imaging like Positron Emission Tomography & Computed Tomography (PET-CT) with 18-F Fluorodeoxyglucose (FDG) has been extensively used in oncology to assess the glucose metabolism in tumor cells since long. It has been further redefined to use other radiopharmaceutical targets capable of tumor characterization, microenvironment, angiogenesis, proliferation, apoptosis, receptor expression and few others. Among these the receptor expression in tumors have been studied in detail and specific imaging probes have been developed for imaging with either Single Photon Emission Computed Tomography (SPECT-CT) or PET-CT. Combination of these diagnostic tool with the same vector has permitted an easy switch from diagnosis to therapy using a therapeutic radionuclide when such expression is documented. Thus in Nuclear Medicine the concept of Theranostics have been utilized with ease and successfully implemented the theranostic concept and has become a valid example of personalized and precision medicine. Imaging and therapy of thyroid cancer, neuroendocrine tumors and castration resistant prostate cancer are current examples of this concept. The Thyroid Gland: A Crossroad in Inflammation-Induced Carcinoma? An Ongoing Debate with New Therapeutic Potential. Thyroid Cancer Incidence 25 Years After Chernobyl, in a Romanian Cancer Center: Is it a Public Health Problem?